It’s Sunday and the time is approaching 1pm, we are taking a stroll up and along Marine Parade, heading towards Kemptown, on our way to The Restaurant at Drakes, which is situated below the chic hotel of the same name. It’s currently the highest scoring restaurant in Brighton according to the Good Food Guide 2014. So truth be told there is no strolling going on here; we are walking at pace, which could be blamed on the drizzly rain but just as much to do with the fact that we want to get to Drakes and eat their dizzyingly good food. The hotel’s smart understated entrance takes the diner through to the bar with the restaurant located on the lower ground floor. The restaurant space is naturally light though, refined and intimate, thankfully bereft of any pretence. Over a glass of local fizz from the folks at Ridgeview in Ditchling we perused the menu; Sunday lunch here offers 2 courses for £25 or 3 for £30, which based on the quality of the food and all being well with it seems an agreeable offer. 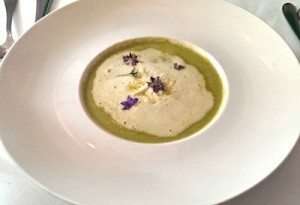 My dining partner opts to for the broccoli soup with blue cheese foam to start, Brighton Blue as well, thumbs up for local produce so far. The not so local Scottish smoked salmon with capers and micro salad grabs my attention for a minute but it’s the green asparagus with poached duck egg and hollandaise that wins over in the end because who doesn’t love a runny yolk and May is National Asparagus month, don’t you know. Once the main courses are ordered our knowledgeable and smiling maître d’ broaches the question of wine; it transpires that she’s also the wine buyer so we take her up on the offer of pairing a different wine for each dish. A cheeky appetiser makes a surprise cameo in the form of a cold tomato consume, flush with vibrant fresh tomato flavours, a light oiliness providing some body with delicately cubed tomatoes and shelled pea halves resting at the bottom of the cup to enliven. First courses arrived shortly after. I had questioned whether a humble soup might fall short but it offered opulence and earthiness in equal measure, enriched with a good dollop of cream and very well seasoned too. The blue cheese foam adding an extra element; subdued enough not to steal the show. Together the asparagus, duck egg and hollandaise were a beautiful thing to gaze upon, a black plate accentuating the bright colours. 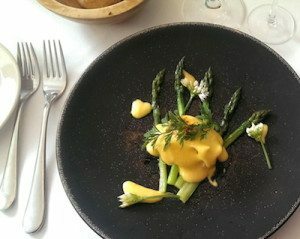 The yolk oozed across the plate, smothering the asparagus, still replete with some bite; the hollandaise delivered adequate richness, a hint of vinegary sharpness, mustard back notes and dashes of black pepper. It should have been a lick the plate moment but I wisely employed hunks of bread to soak up all the remaining goodness. 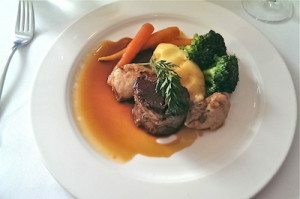 After a well judged interval my main course, braised leg of Hebridean lamb, sweetbreads, creamed pots and baby carrots with a rosemary sauce made its way forth. The meat proved tender, falling apart with the merest of prods from my fork. Sweetbreads, in rich abundance here, were well cooked and heady with flavour. 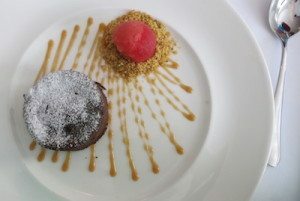 The rosemary sauce was key, housing an underlying sweetness and well judged acidity; for me it brought the dish together. Perhaps some roast potatoes would have added some crispness to the plate but nevertheless the creamed pots were perfectly at home. Roast pots accompany the beef by the way. 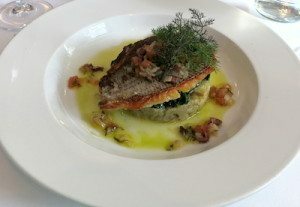 My friends black bream, boasting a satisfyingly crisp skin, sat proud atop a small knoll of wilted spinach and crushed jersey royals, the fillet cooked well; flesh just firm but flaking under contact. Sturdy iron edged flavours from the spinach juxtaposed well with the crushed jerseys, the sauce vierge lending acidity. A Pinot Gris from Alsace benefiting from a few years of bottle age paired excellently with this dish. We were on a roll, with the puds in our midst. 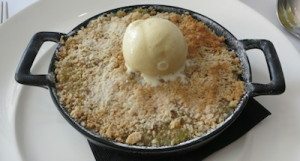 A generously sized apple crumble with vanilla ice cream and custard the epicurean equivalent of a warm hug and a big kiss on the cheek. Always a good move to save the best ‘til last though, bringing us to a stunning chocolate fondant, oodles of intense dark cocoa flavour from the sponge and the obligatory warm gooey chocolate centre, all offset to wonderful effect by a tangy orange sorbet, blood orange in colour, resting on a small bed of crumble. Thank you and good day, a thoroughly enjoyable experience and little did we know after a quick caffeine straightener we’d been wine and dined for over 2 hours. Wine of the day was a Washington State red made from the Syrah grape (aka Shiraz). Lithe in body, a wealth of ripe blackberry fruit a good match for the braised lamb. It had great balance, meaning that its constituent parts (alcohol, tannins, flavour, aroma and acidity) combined to harmonious effect, which is a noble achievement. A wine possessing such a quality should etch itself in the grey matter to try again. Like the red wine, The Restaurant at Drakes accomplishes the gastronomic equivalent of this concept, which is no mean feat. The team here have got it right and so did the Good Food Guide.